A premiere Essex CT Wedding takes place a few miles up the Connecticut River from the Long Island Sound at the Essex Yacht Club. 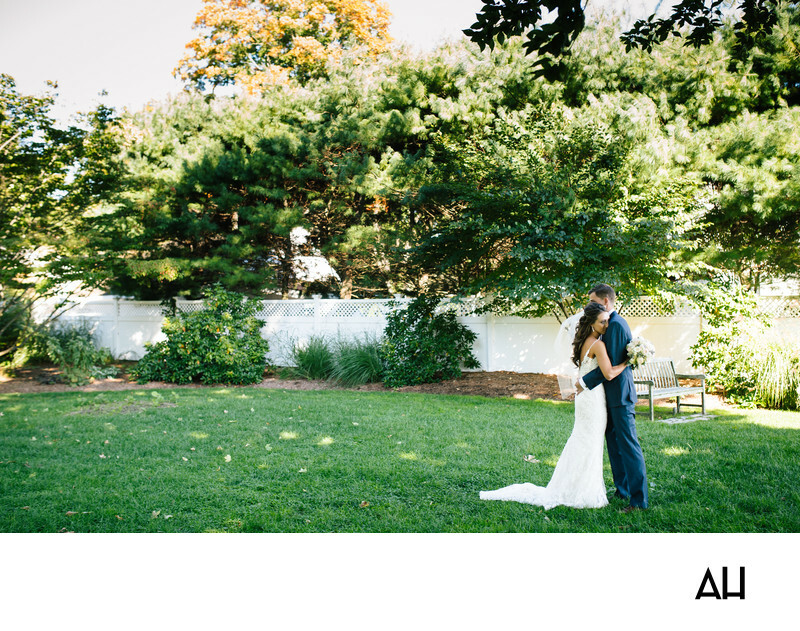 This photograph was taken after the couple’s first look in the yard of an Essex home. In this moment the bride and groom embrace, sharing a second of calm away from guests and the bridal party. This instant is just about these two people, supporting one another in love. The bride looks at home in the arms of her love and it is clear that she feels secure and cared for by her future husband. The sunlight filters through the surrounding trees, dancing around the couple. The white fence gives the couple privacy in this moment of peace. The picture preserves this memory for the couple, reminding them that their wedding day is truly about the love they share. Regardless of how the events of the day go, these two will come out winning, because they have chosen love.